Example of Charlie Chaplin showcasing his onscreen persona. Everyone loves a good story, that’s just human nature. Because of this, a compelling business story can make the difference between building a loyal customer base and becoming just another online boutique in a sea of thousands. Talking about why you chose to start your own business engages a potential customer in a way that your products and product descriptions simply cannot. Think about it: consumers know to have their guards up when they’re being sold something, but you're ‘About Us’ or ‘Our Story’ page doesn’t seem to sell anything at all. It’s a page with pictures and stories about your life, thought processes, and the obstacles that you have overcome, so it doesn’t come off as the crucial bit of marketing that it is. Why Make The Effort To Spin A Good Yarn? Telling your story helps customers put a face to your brand, which separates you from your competition and makes you memorable. Instead of being another handmade jewellery store, your customers can get to know you as the working mother who wanted to build a business empire to leave behind to her children. Instead of being another screen printed t-shirt shop among many, your customers can come to know you as a small group of university buddies who graduated during the credit crunch and banded together to make your own jobs when there were none to be had. These stories resonate with people, are relatable, and show your customers that you’re genuine. And the best part is that you almost certainly have one of these stories yourself, even if you don’t think of yourself as a writer. After all, there’s a reason why you chose to take the road less traveled and strike out on your own as an entrepreneur. Those reasons and that entrepreneurial spirit are inspiring, especially for the vast majority of people who go to work every day for someone else. In your online boutique, you are your own boss, you handpicked your products, and you veered away from the conventional path. In short, you have a story to tell! Let’s look at a few ways to boost the sales of your ecommerce store simply through the art of telling people about yourself. If you’ve never heard of the classic ‘hero’s journey,’ the concept is simple: a great many of our most treasured and timeless tales follow the same model. Virtually every Disney movie follows the classic hero’s journey: a hero starts ordinary, and usually with a disadvantage (think of all the orphans in Disney films). Something happens to push him into an adventure, and along the way he encounters mentors to prepare him for obstacles, insurmountable odds, and ultimately triumphs. Here are are some of the steps in a classic hero’s journey and how you can use each step to craft your ‘About Us’ or ‘Our Story’ page in a way that will resonate with your customers. Once upon a time you were an accountant, a coffee shop barista, struggling with joblessness, or even a corporate lawyer. But then the winds of change began to blow through your life. Here’s where something happened to you that made you want to start your own online store and leave your old life behind. Were you unable to spend time with your family in your old career? Did you discover your true passion? What made you realise that you wanted to build an online store? Here, our hero -- that’s you -- almost missed their chance at adventure and ecommerce glory because they were too afraid. Everyone’s afraid of taking risks, and making yourself vulnerable by talking about all the nagging thoughts that almost held you back can be an inspiration to others. Eventually, you encountered something or someone who gave you advice to prepare you for the difficult journey ahead. Aladdin had his Genie, and Luke Skywalker had Obi-Wan Kenobi. Perhaps you had a teacher or loved one that convinced you that this was the right path, or joined an online forum to start researching your dream business. Your personal Obi-Wan could even be a YouTube video or magazine article that gave you that small push, that extra bit of courage, that you needed to move forward. 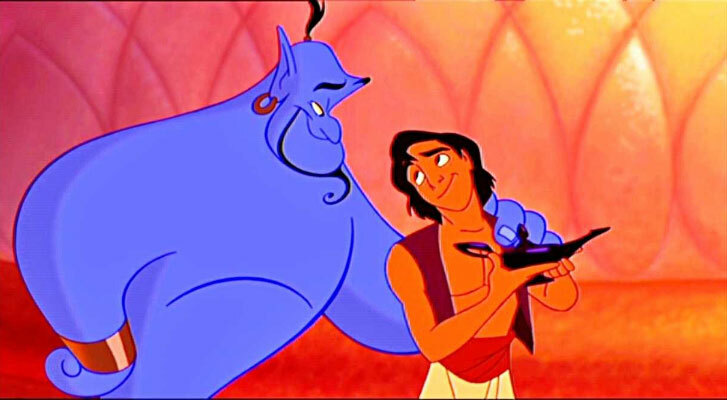 Example of Aladdin with Genie in the Walt Disney classic Aladdin. Once you started on your journey to sell online, it was far from smooth sailing, wasn’t it? What obstacles did you overcome, and what bumps in the road nearly had you certain you couldn’t do it? After setbacks with product design, supply chains, finances, or anything at all, our hero decided to approach the situation a little differently -- and it made all the difference! After surviving through the near-death of their business, our hero persevered and can today boast products and an online business to be proud of. Of course, you don’t need to use all of these elements -- nor should you. They’re simply the classic storytelling elements that made folktales last through the generations and George Lucas and Walt Disney wealthy men. Take the elements that work for you and craft your own story -- one that encapsulates you, your brand, and your vision for the future. • How you source the textiles or raw goods used to make your products. This is always useful to include if you use locally produced goods or ethically sourced goods. Lastly, consider the small business success stories -- both within and outside of your industry -- that inspire and motivate you. Consider why these stories left their mark on you, as they’re likely to be universal themes. Combine those universal elements with your own history, and you’ve got an ‘About Us’ page that will make your business unforgettable.